Last weekend at Sylvan Lake State Park, the solar lantern just was not bright enough for both M's and my reading, so I fired up the single-mantle Coleman lantern to illuminate the trailer. 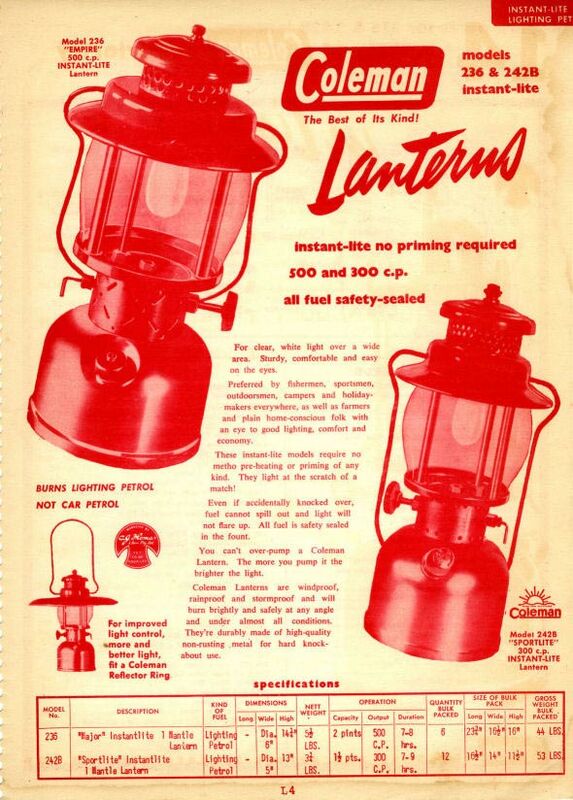 Coast to coast, this lantern has illuminated many campsites. It heated my old van on waterfowling trips in the San Luis Valley as the temperature plunged well below freezing. As best I recall, it came from the garage of an old smelter worker's cottage on Cañon City's unfashionable south side, after a co-worker rented it. With new washers in the pump and a new globe, it was back in operation. The special pungency of Coleman's blended white gas, poured through the distinctive filter funnel — bright red, so you don't leave it sitting on the picnic table, as I almost did last Sunday. You spin the cleaning lever, pump it, light it, pump some more, open the gas — OK, I admit it sounds like starting a Model T Ford or something like that. Apparently an ad for the British market. I never heard of the "Empire" model. Maybe it's that early-20th-century technology. But it works — and you don't send empty gas canisters to the landfill or let them pile up at Base Camp for someone else to deal with. 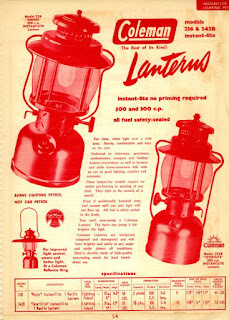 Some people say Aladdin lanterns are quieter and better, but growing up in Colorado and South Dakota, I never saw one. Back in the 1980s when I occasionally served as a camp hand for a local outfitter in return for free outdoor adventure, I heard this story from one of the clients. He had been looking for a little store that existed or was supposed to exist near Red Wing in Huerfano County because we were low on Coleman mantles, the original kind that you tie on with cold-numbed fingers. As the client stood by his truck, he recalled, this ranchman rode up on horseback. When he learned what the problem was, the horseman pulled out his billfold, opened it, and extracted a mantle, which he handed down, saying, "Some fellows carry condoms, but up here, these are more valuable." Or maybe he said "carry rubbers." Anyhow, if it's not true, it should be. Love the story! We've had our Coleman lantern for 31 years and it still works great.